This has been a hard winter in Tennessee. For the first time in years, the mercury dipped below zero degrees (-2 was the lowest I saw) and we had several nights in the zero to 5 degree range. The lack of insulating snow cover and gusty breezes in my windswept hilltop garden compounded the impact of the cold temperatures. The result? 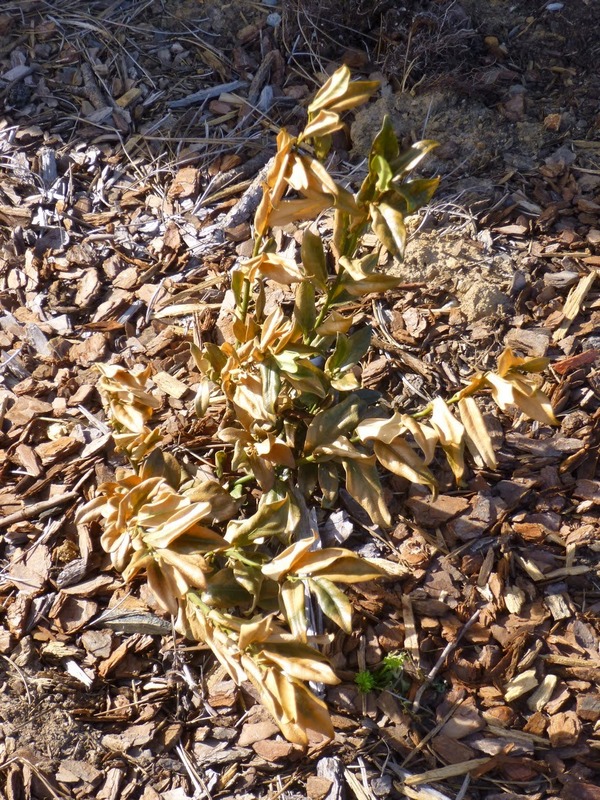 Zone-pushing plants took a real hit -- and even some broadleaf evergreens that should have been OK in my zone (like Sarcococca confusa) seem to have been killed or severely wounded. After singing the praises of camellias in previous years, now I'm faced with the hard truth that they are only marginally hardy in Middle Tennessee. A young camellia that I planted in November in a windy, relatively sunny spot seems to have suffered severe damage. Even this established camellia in a shadier and slightly more sheltered spot seems to have damage on about half its foliage. And then there's Raphiolepsis umbellata, a.k.a. Indian Hawthorn. There were three of these in the back foundation bed (SW exposure) when we moved in. Native to India and Southern China, these members of the rose family are champs when it comes to tolerating heat and drought. They barely blinked and certainly did not wilt even when temperatures regularly soared past 100 degrees during the summer of 2012. Wind and humidity didn't faze them. Rabbits and deer didn't bother them. But the cold seems to have got the better of them. Even the most cold-tolerant varieties are only rated as being hardy to 5 degrees Fahrenheit, and we've fallen below that number a couple of times this winter. I'm seeing what looks like significant foliage damage on all three Hawthorns. 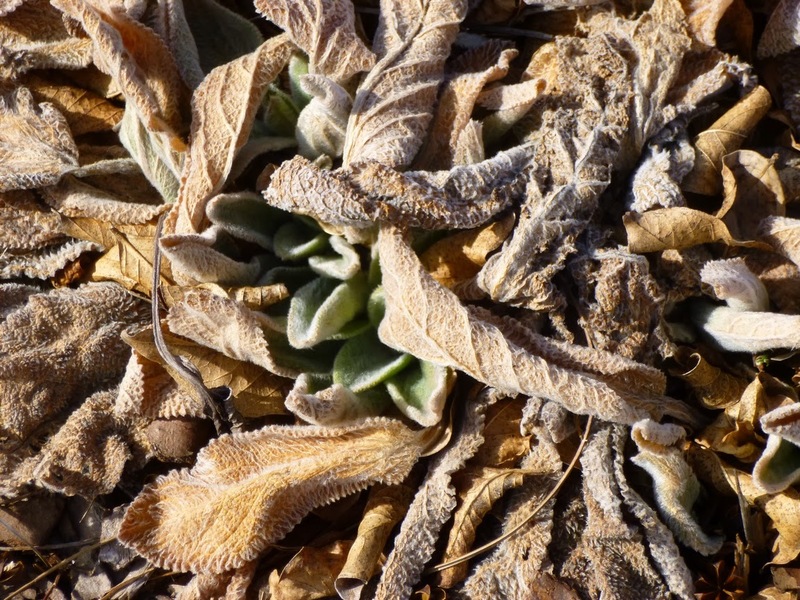 Of course, having never dealt with this before, I don't know whether the plants will shed their leaves in the spring and grow new ones, or whether they're not long for this world. Ajuga genevensis - Much less common but a zone hardier than A. reptans, looks relatively thick, lush and unperturbed by zero degree temps. Rubus calycinoides, Creeping Raspberry looking crispy. Hopefully this one will bounce back. It's rated to zone 6, but it's in a sunny, windy spot where it probably faced unusually high winter stress. Stachys byzantina, Helene von Stein, Lamb's Ear - Most of this looks dead, but rated as hardy to zone 4, so I'm hoping it's just playing possum. There's a bit of fresh new growth peaking out from under the rubble of last year's leaves. 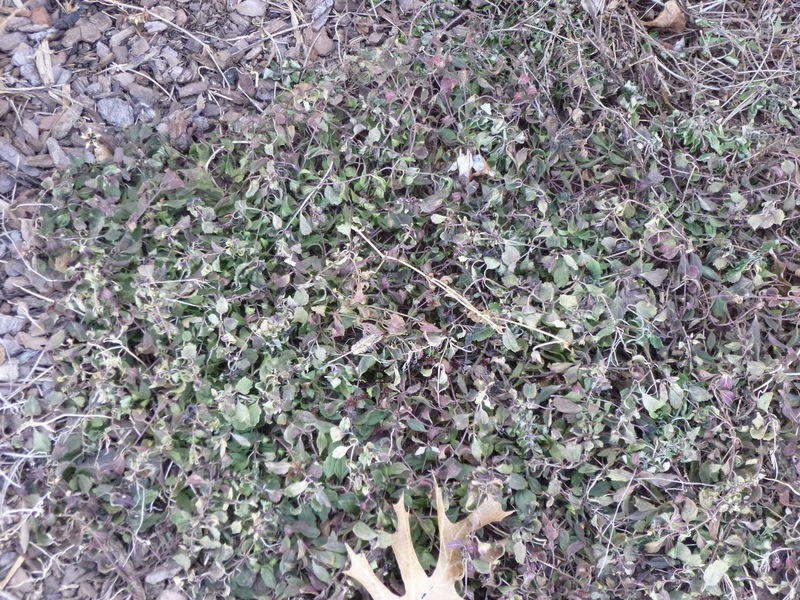 The question is: Do I need to rake away the old growth this spring, or should I let it stay and decompose as mulch/fertilizer? Veronica peduncularis, Prostrate Speedwell "Georgia Blue" - Looking fairly dreadful, but rated as hardy to zone 4 or 5, so again, I'm hoping this will bounce back as the weather warms. 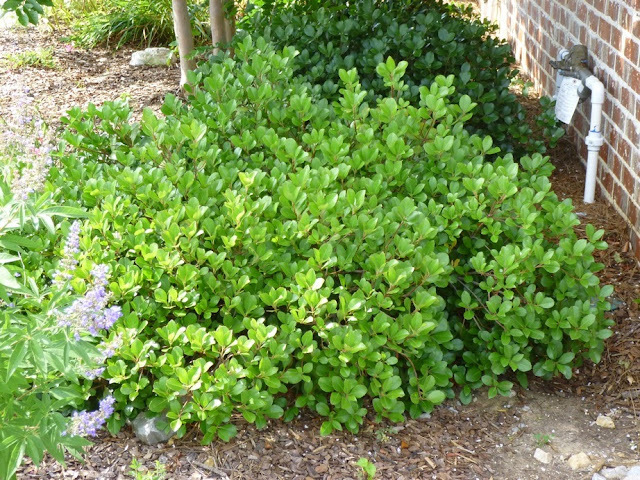 What about the deciduous plants like crape myrtle, vitex, rose of sharon, fothergilla, chokeberry or redbud? 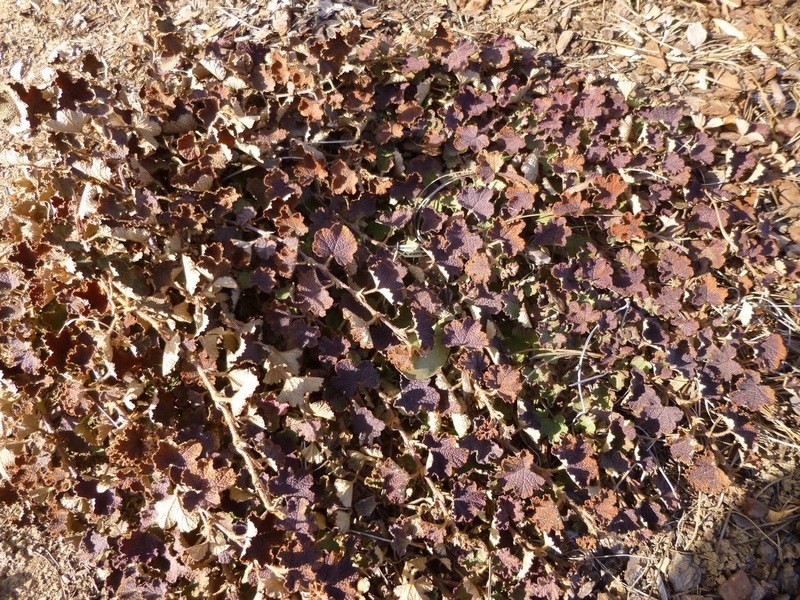 Any damage they've suffered in these cold spells won't be visible for months until the plants leaf out (or not). I'll try to post an update when that happens. 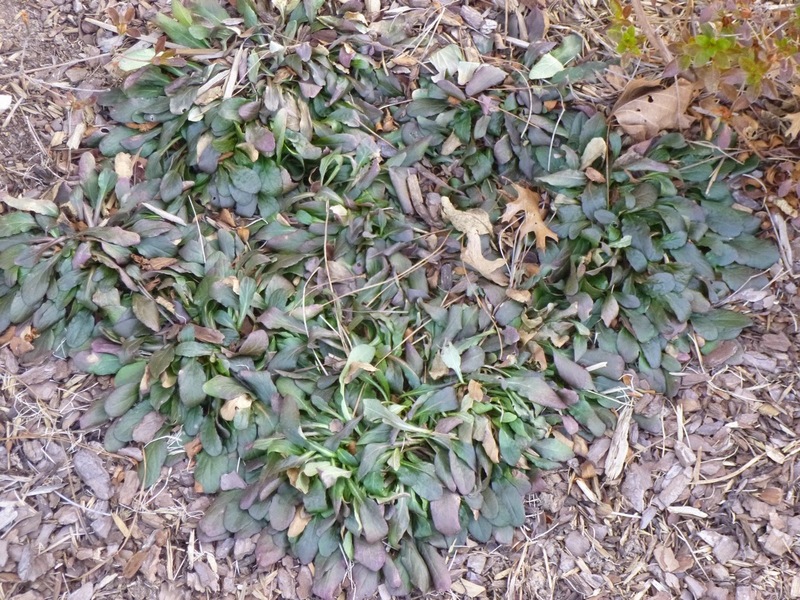 It's hard not to get discouraged seeing how poorly some of the new and established plants have fared in this hard winter. But gardening teaches humility. I've gone back to the drawing board a bit this winter, scratching some ideas off the list and trying to find others that can withstand whatever heat, cold, floods or drought Tennessee's climate can throw at them! So....where does the Hope come in? Juniperus virginiana "Grey Owl" -- rated to zone 2, this charming evergreen with a soft grey-green color has seemed fairly unperturbed, which is no real surprise as it's rated hardy to zone 2. Supposed to eventually reach 3-feet high by 6-feet wide, I'm considering getting several more as replacements for the Indian Hawthorns. As an Eastern Red Cedar, it's native to Tennessee, which is another plus in my book. Viburnum x rhytidophylloides -- Yes, the Latin name is daunting. And the 'common' name of Lantanaphyllum Viburnum really isn't that much friendlier. But last November, I bought and planted the pronounceable and esteemed "Allegheny" variety, which is supposedly more resistant to bacterial leaf spot than the species. (Always a good thing.) Allegheny viburnum is supposed to tolerate drought, pollution and heat. Thrown into the crucible its first winter in the ground, I can report that it has held onto at least a few of its leaves, which turned a lovely purplish color. And it's very encouraging to see the new baby leaves taking shape at a time when there are not many other signs of life in the garden. So hope does spring eternal! A maple branch starts to color up against a bright blue sky on a clear and seasonable February day.